The Fallon Youth Club would like to express our deepest heartfelt thanks to Wendy, Rose and all the other wonderful employees of Bank of America. They are an amazing group of people who routinely provide various items to directly support our members. Over the last year they have provided Christmas stockings filled with thoughtful items and personal care packages for various ages. These thought gifts are very appreciated!!! It's almost that time!!! Save the date for the 2013 Fallon Youth Club annual dinner auction, September 21, 2013. This year's event will be held at the Slanted Porch once again!! Thanks to Steve, Peggy and all the wonderful staff for supporting our mission again this year!!! Our mission is to inspire and enable all young people, especially those from disadvantaged circumstances to realize their full potential as productive, responsible and caring citizens. 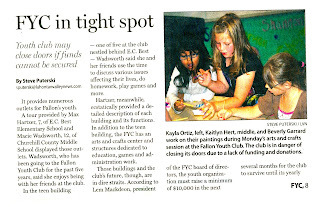 After this article ran, I had many questions from different kids here at the Club. Many were concerned or scared at the thought of The Fallon Youth Club closing. For many of our kids we ARE the consistent, concerned happy adults they wait to see everyday! One little one in particular, Kayla, (the dark haired girl pictured here) asked me, "Miss Myndee, is the Club closing?" I told her not right now, but we have to start raising money to keep our doors open. She said,"WHAT! I will do anything for FYC! ", as she reached into her pocket and gave me $ .50. "I LOVE FYC!!! I will help!" This kind and thoughtless consideration of giving back to her Club overwhelmed me with emotion. I gave little Kayla a BIG hug and thanked her! I love to see the mission in motion! The Summer Food Service Program is set to begin Monday June10, 2013. This program will run Monday through Friday for ten weeks. 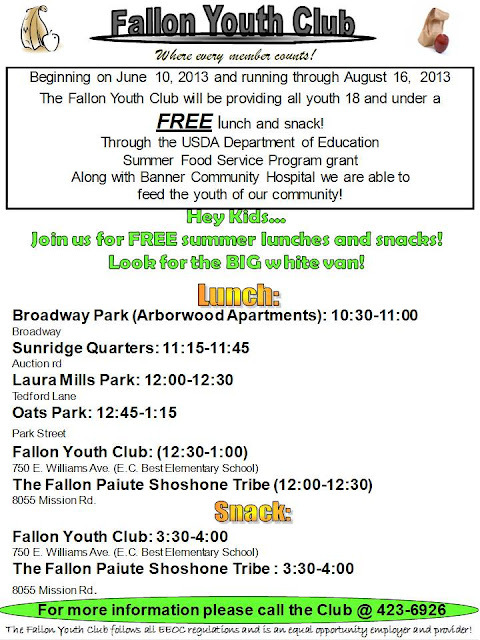 (No Lunches will be served on Thursday July 4, 2013) Lunches will resume on Friday July 5, 2013 and run through Friday August 16, 2013! 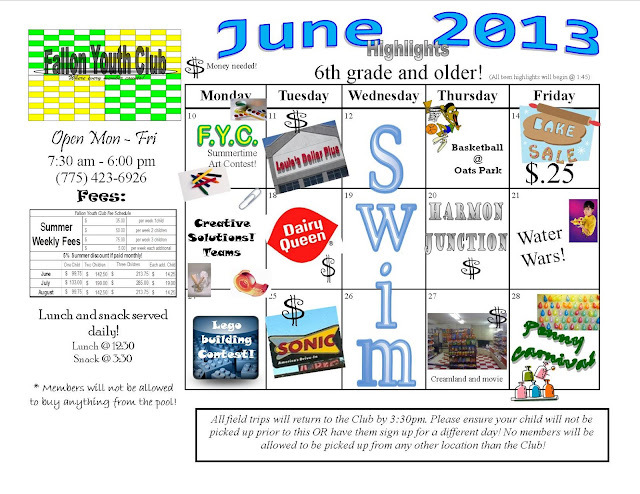 Here are the highlights for June! We have two sperate highlights, one for the 6th grade and older and of course one for the 6 years - 5th grade! Keep in mind these are only some highlights...there are fun things to do ALL DAY LONG!!! As always, during the Summer months please ensure your kids are dressed to get wet!! It gets hot and we love to play in the water! !